This Month’s Wednesdays are Gin-tastic! As we move into the cool weather of September, what better way is there to wind down than drinks at The Warren? This month’s cocktail classes will have a decidedly gin flavor to help you get over the terror of humpday. Come on down and check them out. Gin Wednesday’s are the flavor of the month for this month’s cocktail classes. Not sure what the cocktail classes are? Starting Wednesday, August 19th at 6:30, we began our Cocktail Classes to help you show off for your friends. They are open to any and all that would like to learn to sling drinks. Always wanted to impress your friends with your knowledge of the history of the Tom Collins? Always wanted to know who Tom Collins is? Come by The Warren and let us show you how it’s done. Each month we will introduce a different base liquor, so that there is always something new to learn. Each class will feature one classic cocktail and one Warren Original. You’ll learn the proper terminology and technique, as well as some history behind the beverages we make. Our excellent staff will show you the ropes for the classic, and then let you try your hand on your own with one of our specialty recipes. But it doesn’t end there! You’ll get to try a the classic beverage we prepare and, of course, enjoy the specialty we teach you to prepare. We’ll also send you home with the ingredients for the specialty drink so that you start practicing right away! Gin Wednesdays are the place to be! When you’re done with your class, take a load off and enjoy some of The Warren’s award winning food. 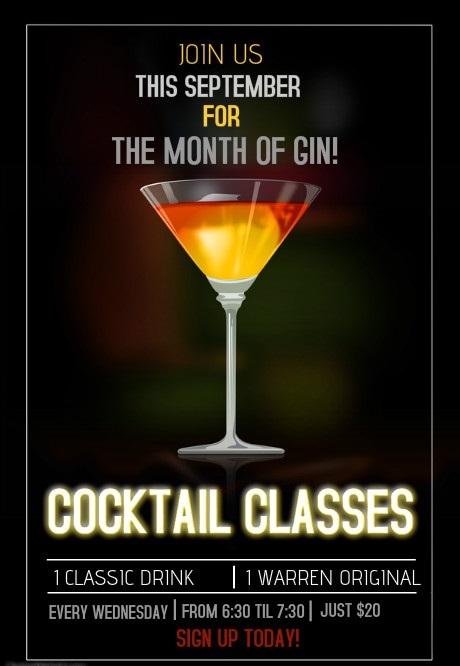 Call 404-789-3999 today and reserve your spot for our Cocktail Classes. The only school where drinking is encouraged! The Warren’s first Cocktail Class was a success (! ), even if it was a little rainy. This is the last Wednesday that you can come by and try your hand at our vodka drinks before we move on to new things. Don’t know what Cocktail Classes on Warren Wednesdays are? Let me elucidate. Starting Wednesday, August 19th at 6:30, we began our Cocktail Classes to help you show off for your friends. They are open to any and all that would like to learn to sling drinks. Always wanted to impress your friends with your knowledge of the different types of mules (you know they’re not just from Moscow anymore)? Always wanted to know why they are served in that awesome copper mug? Come by The Warren and let us show you how it’s done. Warren Wednesdays are the place to be! When you’re done with your class, take a load off and enjoy some of The Warren’s award winning. Call 404-789-3999 today and reserve your spot for our Cocktail Classes. The only school where drinking is encouraged!